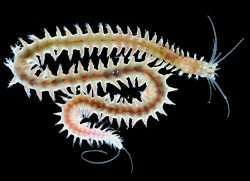 The marine worm Platynereis dumerilii. Credit: Kristin Tessmar-Raible. Humans have retained genomic characteristics of a very ancient ancestor that have been lost in simpler animals such as the fly, indicating that humans are one of the most slowly evolving species. This is the finding of an international team of scientists including Dr David Ferrier of Oxford’s Department of Zoology published in a recent edition of the journal Science. The genes of animals usually contain extra bits of DNA sequence, called introns – regions that are removed before cells make their proteins. Humans have many introns in their genes, while common animal models such as flies have fewer. From an evolutionary perspective it was long assumed that the simpler fly gene organization would be more ancient. The new study reveals the opposite: early animals already had a lot of introns, and quickly-evolving species like flies have lost most of them. Worm-like creatures which lived more than 550 million years ago are thought to be the last common ancestor of almost all living animals, including worms, flies and humans. In order to better understand the genetic make-up of this creature, the team sequenced part of the genome of a living marine worm, Platynereis dumerilii, which has very similar characteristics. They found that Platynereis genes have almost the same number of introns as humans (often in the same place), and many more than insects.